"2 in 1": Sales pack includes handheld and Software. Handheld and Software are 100% identical in terms of functionality and compatibility: Ideal for data exchange between the handheld and Software, between the teacher and pupils. The new TI-Nspire CX II-T CAS with colour display provides a combination of a handheld and Software! Whether in the classroom or at home, any kind of mathematical or scientific exercise can be solved with this computer algebra system (CAS). Thanks to parallel operation, files can be created on the PC and easily transferred to the handheld and vice versa. Import your own images and superimpose graphs, points, etc. 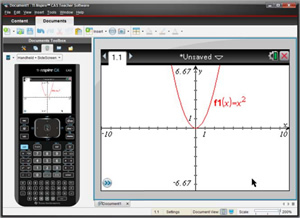 Scratchpad (notepad) in the Home view for quick calculations (Calculator) and function graphs (Graph) without saving. Variable page layout for parallel display of up to 4 working areas. ...Algebra including arithmetic with undefined variables, factoring and expanding polynomials and roots in equations. ...Differentiation and integration including indefinite integrals, derivatives, limits and Taylor polynomials. Graphs & Geometry: geometrical constructions, scatter plots, function, parameter, polar and sequence graphs, 3D function graphs! Notes: Text editor for instructions and notes New! Interactive linking (TI InterActive!™) of maths fields e.g. of formulas from the text with the applications. Power adapter for battery-free power supply for TI-84 Plus CE-T, TI-Nspire CX Handheld and other electronic devices with USB power supply. Rechargeable lithium-ion battery for up to 100 hours power for your TI-84 Plus C Silver Edition, TI-Nspire CX or TI-Nspire CX CAS Handheld before June 2014!). The TI-Nspire CX docking station can be used to charge batteries for the Handheld (CX series), send TNS files (worksheets) and update the operating system. Rechargeable lithium-ion battery for up to 100 hours power for your TI-84 Plus CE-T, TI-Nspire CX or TI-Nspire CX CAS Handheld from June 2014!). Data collection system for science & mathematics. Functions with all TI-Nspire handhelds and TI-Nspire Software. Compatible with almost all Vernier sensors! CAS graphing calculator with 3.5" colour display touchscreen, 400 MHz ARM processor, 32 MB RAM + 256 MB flash ROM, incl. USB-PC link. Algebraic and RPN input. Graphic calculator with Computer-Algebra-System and high-resolution, colour touchscreen display. The latest model in the ClassPad series offers intuitive operation and is a vivid educational tool for mathematics.